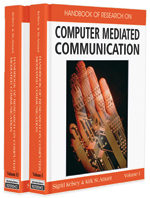 This chapter provides an overview of current issues and trends related to the impact and integration of computer mediated communication (CMC) and technological innovation in the teaching and learning environments of higher education in the United States. The chapter includes an introduction to the higher education arena, and then focuses on the current learning and teaching environments. Topics such as learning styles, learning behaviors, and CMC as an infrastructure in the student environment are discussed, along with transformational changes in the teaching environment. Recent fundamental changes in teaching and learning due to the incorporation of CMC are also discussed. Learning Objects: As described in the metadata draft standard for learning objects is any entity, digital or non-digital, that may be used for learning, education or training..IEEE, http://ltsc.ieee.org/wg12/files/LOM_1484_12_1_v1_Final_Draft.pdf, last accessed on 12-15-06. Bricolage: The ability to piece together information obtained from multiple sources. Information and Communication Technology (ICT): Is a broad term used to describe a transmission or idea exchange using equipment, tools, or networks. Examples of ICTs include: the Internet, cell phones, and personal digital assistants (PDA). Blended or Hybrid Courses: Higher education courses with both face-to-face and digital or online components. Net Generation: Individuals born between 1981 and 1994, whose defining characteristic is their familiarity with the Internet. Learning Ecology: A collection of overlapping, self-organizing, constantly evolving communities of interest that may facilitate the exchange of information among individuals and groups (Brown, 2002). Teaching and Learning Centers: Offices or organizations on college or university campuses which build community among faculty members; offer classes and training on technology, pedagogy, or teaching skills; host conferences and workshops; and provide faculty and instructional staff who can help support teaching and student learning. Brick or Click: An organization that offers both an online (Internet) presence as well as a physical one; originally referred to businesses that offered their services both via the Web as well as in traditional retail outlets.